National Hairball Awareness Day Friday! Friday April 24 is National Hairball Awareness Day! 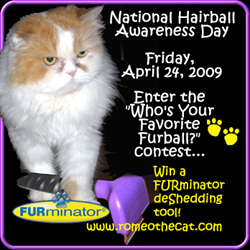 To celebrate, www.RomeotheCat.com and FURminator, Inc. (www.furminator.com) are sponsoring the “Who’s Your Favorite Furball?” contest! The winner will receive a free FURminator deShedding Tool. They will also see their favorite, funniest, furriest furball featured on www.PeoplePets.com and other popular pet blogs across the Internet. Visit www.RomeotheCat.com and click on the FirstGiving link to donate $1 or more to Romeo’s FURPOWER campaign. This month’s beneficiary is Kitten Rescue of Los Angeles. Check the Favorite Furball gallery on www.romeothecat.com to see all the entries. Wait for the random drawing to see if you’re the winner. Come on back at noon Friday and see if you’re the lucky winner! The winner will be announced on www.romeothecat.com, www.PeoplePets.com and participating blogs (that would be here) at 12 p.m. EST Friday, April 24, 2009. Here’s a unique and innovative way of using social media: Romeo the cat (and his buddy Pugsley) are using Twitter to raise funds for rescue organizations. For every follower they get on Twitter, they donate 5 cents to animal rescue. Twitterers are encouraged to donate to the cause, as well. For the month of March, 2009, I’m pleased to report that the proceeds from the campaign will go to Animals in Distress, the no-kill shelter at which I volunteer each week. I offer Reiki to the animals there and hold Reiki classes for the volunteers. If you use Twitter, please support Romeo‘s campaign by following @romeothecat on Twitter.